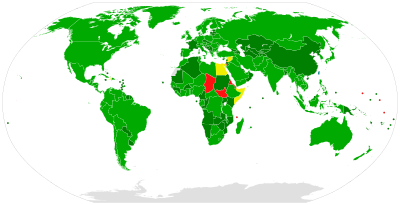 The list of parties to the Biological Weapons Convention encompasses the states who have signed and ratified or acceded to the international agreement outlawing biological weapons. On 10 April 1972, the Biological Weapons Convention (BWC), also known as the Biological and Toxin Weapons Convention (BTWC) was opened for signature. The Netherlands became the first state to deposit their signature of the treaty that same day. The treaty closed for signature upon coming into force on 26 March 1975 with the deposit of ratification by 22 states. Since then, states that did not sign the treaty can only accede to it. A total of 197 states may become members of the Biological Weapons Convention, including all 193 United Nations member states, the Cook Islands, the Holy See, the State of Palestine and Niue. As of September 2018, 182 states have ratified or acceded to the treaty, most recently Central African Republic in September 2018. As well, the Republic of China (Taiwan), which is currently only recognized by 16 UN member states, deposited their instruments of ratification of the BWC with the United States government prior to the US's decision to switch their recognition of the sole legitimate government of China from the Republic of China (ROC) to the People's Republic of China (PRC). A further five states have signed but not ratified the treaty. According to a Report to the Meeting of States Parties to the Convention, as of September 2018 182 states have ratified the BWC. However, the status of the succession of a number of additional states to the BWC is unclear. For further details, see the Succession of colonies to the BWC section below. Multiple dates indicate the different days in which states submitted their signature or deposition, varied by location. This location is noted by: (L) for London, (M) for Moscow, and (W) for Washington D.C.
^ Croatia's effective date of succession was 8 October 1991. ^ Dominica's effective date of succession was 3 November 1978. ^ The Chairman of the Meeting of the States Parties to the BWC reported that Guinea had submitted an instrument of accession in 2011 that the depositaries deemed to be legally insufficient to become a party to the treaty. ^ Montenegro's effective date of succession was 3 June 2006. ^ Macedonia's effective date of succession was 17 November 1991. ^ The FR Yugoslavia's (later Serbia and Montenegro) effective date of succession from the SFR Yugoslavia was 27 April 1992, while Serbia's effective date of succession from Serbia and Montenegro was 3 June 2006. ^ Vanuatu's effective date of succession was 30 July 1980. The Republic of China (Taiwan), which is currently only recognized by 16 UN member states, deposited their instruments of ratification of the BWC with the United States government prior to the US's decision to switch their recognition of the sole legitimate government of China from the Republic of China (ROC) to the People's Republic of China (PRC) in 1971. When the PRC subsequently ratified the treaty, they described the ROC's ratification as "illegal". The ROC has committed itself to continue to adhere to the requirements of the treaty, and the United States has declared that they still consider them to be "bound by its obligations". The following five states have signed, but not ratified the BWC. ^ As per the advanced version of the 2017 Report of the Chairman on Universalization Activities to the Meeting of the States Parties to the Convention on the Prohibition of the Development, Production and Stockpiling of Bacteriological (Biological) and Toxin Weapons and on Their Destruction. ^ As of September 2017, a ratification bill has been approved by the Cabinet of Ministers and submitted to parliament. ^ Ratified by Tanzania's National Assembly in November 2018. The following 10 UN member states have neither signed nor ratified the BWC. Status unclear: see succession of colonies to the BWC below. ^ Parliamentarians for Global Action reported in June 2017 that Chad's National Assembly had recommended the government ratify the agreement. ^ In 2007, the Chairman of the Meeting of the States Parties to the BWC reported that ratification of the BWC had been approved by the government of Comoros pending signature by the President. ^ a b Neither Kiribati or Tuvalu are listed as parties to the BWC in documents from the Meetings of the States Parties to the BWC, but their status is unclear. See succession of colonies to the BWC below. ^ Kiribati's Deputy Permanent Representative to the United Nations committed in 2016 to recommend accession to the treaty. ^ Jane Jimmy Chigiyal, Permanent Representative to the United Nations of Micronesia, reported in 2016 that a recommendation to accede had been made the prior year. The status of several former dependent territories of a state party to the BWC, whose administrating power ratified the Convention on their behalf, with regards to the Convention following their independence is currently unclear. According to the Vienna Convention on Succession of States in respect of Treaties (to which 22 states are party), "newly independent states" (a euphemism for former colonies) receive a "clean slate", such that the new state does not inherit the treaty obligations of the colonial power, but that they may join multilateral treaties to which their former colonizers were a party without the consent of the other parties in most circumstances. Conversely, in "cases of separation of parts of a state" (a euphemism for all other new states), the new state remains bound by the treaty obligations of the state from which they separated. To date, this Convention has only been ratified by 22 states. ... in respect of the United Kingdom of Great Britain and Northern Ireland, Dominica and Territories under the territorial sovereignty of the United Kingdom, as well as the State of Brunei, the British Solomon Islands Protectorate and, within the limits of the United Kingdom jurisdiction therein, the Condominium of New Hebrides [subsequently renamed Vanuatu]. This declaration bound the territories of Kiribati and Tuvalu to the terms of the Convention. Following their independence, none of these states have made unambiguous declarations of succession to the BWC. Dominica and Vanuatu's statuses were likewise ambiguous from their independence until 2016. Since then, none of the depositaries for the BWC have received an instrument of accession or succession to the Convention from Kiribati. However, the Government of Kiribati has made statements suggesting that it does not consider itself a party to the treaty. The Government of Tuvalu desires that it should be presumed that each treaty purporting or deemed to bind Tuvalu before Independence has been legally succeeded to by Tuvalu and that action should be based on such presumption unless and until the Government of Tuvalu decides that any particular treaty should be treated as having lapsed. Since then, none of the depositaries for the BWC have received an instrument of accession or succession to the Convention from Tuvalu. However, the Government of Tuvalu has made statements suggesting that it does not consider itself a party to the treaty. The Government of Dominica later stated that it did not consider itself bound by the Convention. However, Dominica was listed as a state party to the BWC in documents from the Meetings of the States Parties to the BWC. The UK Treaty Office (as depositary) did not receive an instrument of succession from Dominica until 2016. In 1980, the territory gained their independence. Vanuatu was listed as a state party to the BWC in documents from the Meetings of the States Parties to the BWC, however the Government of Vanuatu made statements suggesting that it did not consider itself a party to the treaty and the UK depositary had no record of receiving an instrument of succession to the BWC from Vanuatu until 2016. ^ "Latest Information". United Nations Office at Geneva. Retrieved 2018-09-25. ^ a b c d e f g h "Report on universalization activities". Meeting of the States Parties to the Convention on the Prohibition of the Development, Production and Stockpiling of Bacteriological (Biological) and Toxin Weapons and on Their Destruction. 2018-08-09. Retrieved 2018-11-08. ^ a b c "Convention on the Prohibition of the Development, Production and Stockpiling of Bacteriological (Biological) and Toxin Weapons and on their Destruction". United Nations Office for Disarmament Affairs. Retrieved 2013-03-03. ^ a b c d "Convention on the Prohibition of the Development, Production and Stockpiling of Bacteriological (Biological) and Toxin Weapons and on their Destruction". Foreign and Commonwealth Office. Archived from the original (PDF) on 2013-01-04. Retrieved 2015-02-10. "Convention on the Prohibition of the Development, Production and Stockpiling of Bacteriological (Biological) and Toxin Weapons and on their Destruction". Foreign and Commonwealth Office. Retrieved 2013-07-23. ^ "Convention on the Prohibition of the Development, Production and Stockpiling of Bacteriological (Biological) and Toxin Weapons and on their Destruction" (PDF). United States Department of State. 2013-03-26. Retrieved 2013-07-23. ^ Конвенция о запрещении разработки, производства и накопления запасов бактериологического (биологического) и токсинного оружия и об их уничтожении (in Russian). Ministry of Foreign Affairs of Russia. 2013-04-17. Retrieved 2015-08-28. ^ "Croatia: Succession to Biological Weapons Convention". United Nations Office for Disarmament Affairs. Retrieved 2013-03-03. ^ "Status of universalization of the Convention" (PDF). Seventh Review Conference of the States Parties to the Convention on the Prohibition of the Development, Production and Stockpiling of Bacteriological (Biological) and Toxin Weapons and on Their Destruction. 2011-10-10. Retrieved 2014-10-12. ^ "Montenegro: Succession to Biological Weapons Convention". United Nations Office for Disarmament Affairs. Retrieved 2016-08-10. ^ "North Macedonia: Succession to Biological Weapons Convention". United Nations Office for Disarmament Affairs. Retrieved 2019-03-12. ^ "Serbia: Succession to Biological Weapons Convention". United Nations Office for Disarmament Affairs. Retrieved 2013-03-03. ^ "UAE ratifies BWC". United Nations Office at Geneva. Retrieved 2008-07-29. ^ "Viet Nam: Signature of Biological Weapons Convention". United Nations Office for Disarmament Affairs. Retrieved 2013-03-03. ^ "China: Accession to Biological Weapons Convention". United Nations Office for Disarmament Affairs. Retrieved 2013-03-03. ^ "Maigre bilan du Parlement : Près d'une vingtaine d'instruments internationaux en souffrance". 2018-11-19. Retrieved 2018-11-26. ^ "Tanzania: Dar Ratifies African Charter On Statistics". AllAfrica.com. Retrieved 2018-11-15. ^ "Biological Weapons Disarmament Updates (June 2017)". Parliamentarians for Global Action. 2017-06-28. Retrieved 2017-07-04. ^ "Report of the Chairman on universalization activities" (PDF). Meeting of the States Parties to the Convention on the Prohibition of the Development, Production and Stockpiling of Bacteriological (Biological) and Toxin Weapons and on Their Destruction. 2007-12-11. Retrieved 2014-10-12. ^ a b c "Report on universalization activities" (PDF). Meeting of the States Parties to the Convention on the Prohibition of the Development, Production and Stockpiling of Bacteriological (Biological) and Toxin Weapons and on Their Destruction. 2015-11-05. Retrieved 2017-10-31. ^ a b "Eighth Review Conference of the States Parties to the Convention on the Prohibition of the Development, Production and Stockpiling of Bacteriological (Biological) and Toxin Weapons and on Their Destruction" (PDF). 2016-06-15. Retrieved 2017-09-25. ^ "United Kingdom of Great Britain and Northern Ireland: Ratification of Biological Weapons Convention". United Nations Office for Disarmament Affairs. Retrieved 2013-07-26. ^ a b c d e f g h i j "Building a Global Ban: Why States Have Not Joined the BWC" (PDF). BioWeapons Prevention Project. April 2009. Retrieved 2013-07-26. ^ "Council Decision CFSP/2016/51 of 18 January 2016 in support of the Biological Weapons Convention - Report -Regional workshop to promote the universalisation of the BWC in the Pacific" (PDF). 2017-07-28. This page was last edited on 12 March 2019, at 18:21 (UTC).